Today’s practice can be seen as a progression of the one explained in my last piece (door 10). By progression, I simply mean going from a principle-oriented task to a more situation-oriented one where there is more similarity to the real game rather than trying to simply exacerbate the principle. As such there is clear directionality (here is given by two standard goals), there are positional roles like those in the system employed and of course there are strategic guidelines regarding the game model or adapted to a specific opponent. This game is a big sided game (i.e. more than 12 players involved) played in the dimensions shown in the picture and the game-space is divided in two zones on which there is the numerical distribution shown. The players from the purple zone cannot move into the biggest zone and the players in the biggest zone cannot move into the purple one until the ball has been played there at least once without interception. In the standard version, the ball always starts from the red goalkeeper and the aim is to build up to score a goal. For their part, the blue players display a high pressing and their aim is to score a goal and then counterattack quickly. 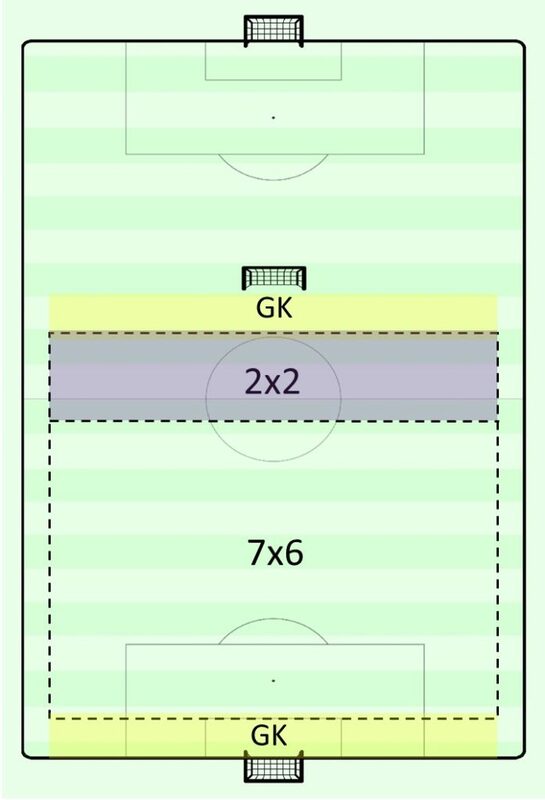 The yellow zone is called the GK zone and no attacking player can enter there. The reasons to employ this are explained in this thread. As always, and especially given the versatility of this game-task, such rules can be adapted to emphasize different features of the game model or another specific reason such as number of players available, strategical adaptation, day of the week, etc. The task is directed to contextualise the principles of verticality orientation in a game model based on depth dynamics under a system including two central forwards. As discussed above and in coherence with the previous piece it wants to emphasize the connection with the forwards to then attack the big goal with positional superiority. To do so, the team in possession should first provoke the pressure and build up in order to create the passing line with the forwards but also creating space to then connect in a third man. However, given the nature of this game-task it does not include any sort of scoring system variation, since we want to simply create the situations to score a goal from such display. Consequently, rules like “a third man move has to be completed before scoring” aren’t used (but they can be useful in many circumstances) so if the player in possession can simply connect with the central forward to directly shot on goal it would be totally valid. The players in the biggest zone have to execute the basis of the positional game in order to build up under high pressing, this is going to be facilitated by the numerical superiority given by the configuration but also because of the involvement of the goalkeeper (note: during the build-up the goalkeeper can be pressed in the yellow zone by the opponents). Manipulation to open vertical options. Players have to recognise when to play short and when to play long but not only provided there is option to play long but given that the longest options is a potential advantage. Due to the numerical relationship in the first sector creating advantages to progress is going to be possible, thus provoking the pressure is not the only option available. It is going to be likely an extensive use of third man actions that allow progressing in a more stable way while at the same time being able to create quick shooting actions if the opponents do not defend aggressively enough the first pass towards the forwards. Interestingly enough, the role of the goalkeeper is highlighted (but it can be done even more with a 6v6 instead of 7v6) in the build-up, his role is key given that he always will start the sequence and that due to the numerical relationship is going to be the free-man many times. He have to be aware of the best way of starting and following the possession. As such, this task can be very demanding for the goalkeepers. Furthermore, we should note here the strategical dimension of knowing what the opponent is expecting or trying to achieve to exploit the options they are leaving less protected. 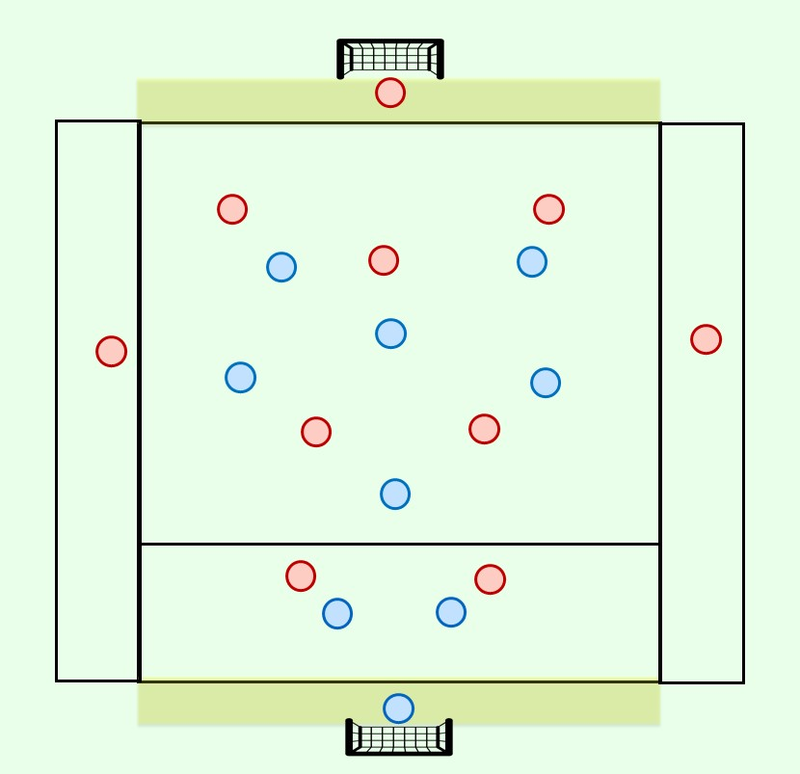 In this case given the numerical superiority, if the opponents want to press high (which is actually what we are assuming as their task but again, depends on the chosen style) they are going to be prone to be attracted in the vertical axis and as such leaving open the direct route to the central forwards. The main role of the central forwards in the purple zone is to avoid being defended/marked by the defenders and co-ordinating themselves to create both depth options, being connected and exploit the positional superiority to quickly create a shot. They have also to be aware of when the situation needs a lay off to then make a quick readjusting movement in order to dismark from the defenders. In the opposite vein, the task of the blue team can be understood as trying to create aggressive pressure in numerical inferiority against a team in numerical superiority while at the same time trying to block the central vertical options. Conversely, there are some functional variations that can be used including starting the possession in the blue team (and changing the numerical relationship) in order to work either/both positional attack in the opposite half, defensive organisation and counterattacking by connecting with the blue players, counterpressing situations and so on.